Before I visited the Kargil War Memorial at Drass, Tiger Hill, Tololing Hill were mere names for me associated with the 1999 Kargil War. Only when I stood in the shadow of Tololing Hill I realized how close it is to the road. Hell, it is right across the Srinagar Leh Highway NH 1D! The battle was fought that close to the city! Pause for a moment and think about the altitude at which the war was fought. Tiger Hill at its peak is 5307 meters high. If you watch the documentary screened in the audio visual room at the war memorial, you can see at what great heights the entire battle was fought. I have been above 5000 meters only once in my life, when I was trekking to the Everest Base Camp. And I know what it feels like, just to walk at that altitude! 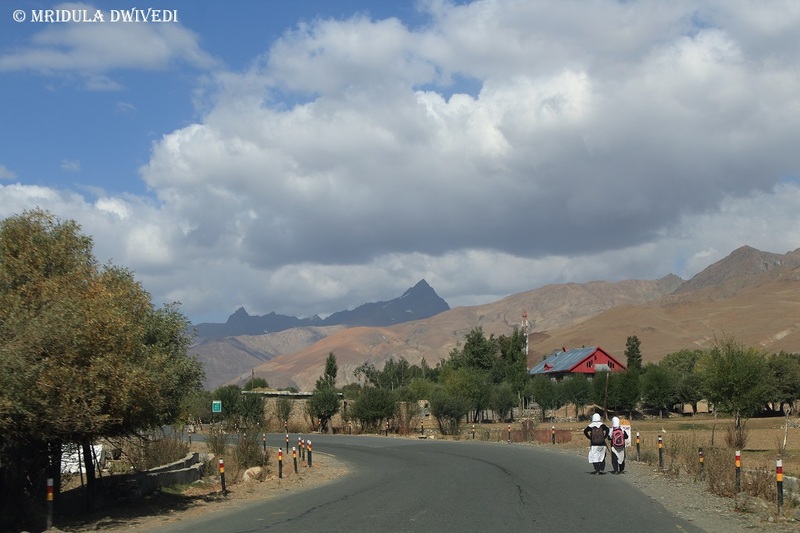 Kargil War Memorial is situated on the Srinagar Leh Highway. Kargil was my base where I was staying with the Axis Dil Se team. 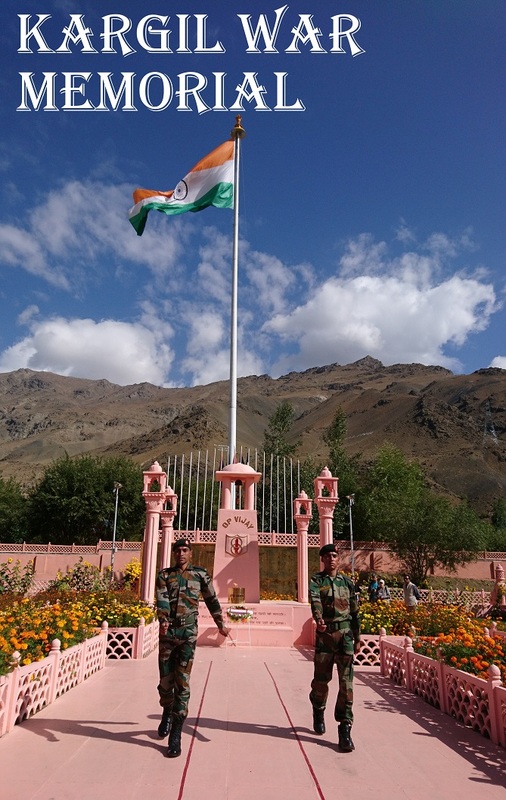 The War Memorial is about 60 Kilometers from Kargil, and 8 km from Drass. At the entrance you are required to show an ID proof. For us, they let us go in with one ID in the group. There is no entry fee to visit the memorial. The War Memorial is right below the Tololing Hill. 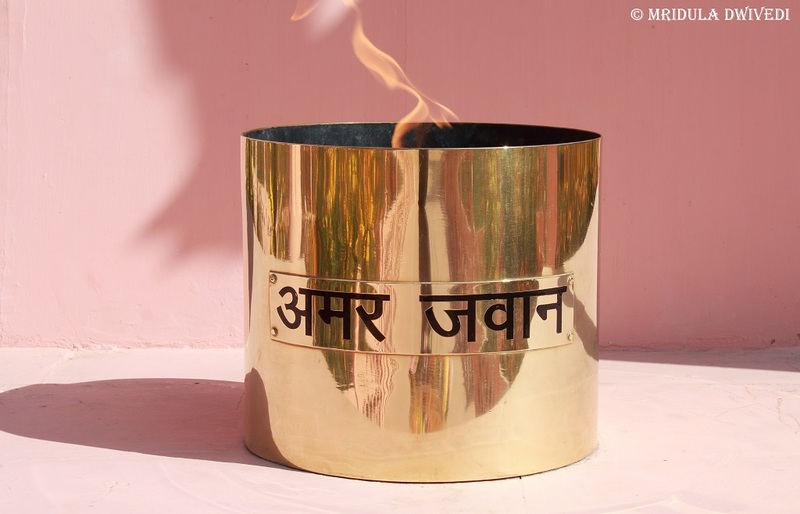 At its heart are the Amar Jawan Jyoti and the Wall of Heroes. When I looked at the size of the wall and the names inscribed, the enormity of the war dawned upon me. Such a staggering number of young lives were lost … It is not that I was not aware of it before, but at Drass it was staring me right in my face. I am not prone to goosebumps easily, nor do I like to put on sunglasses on my eyes. 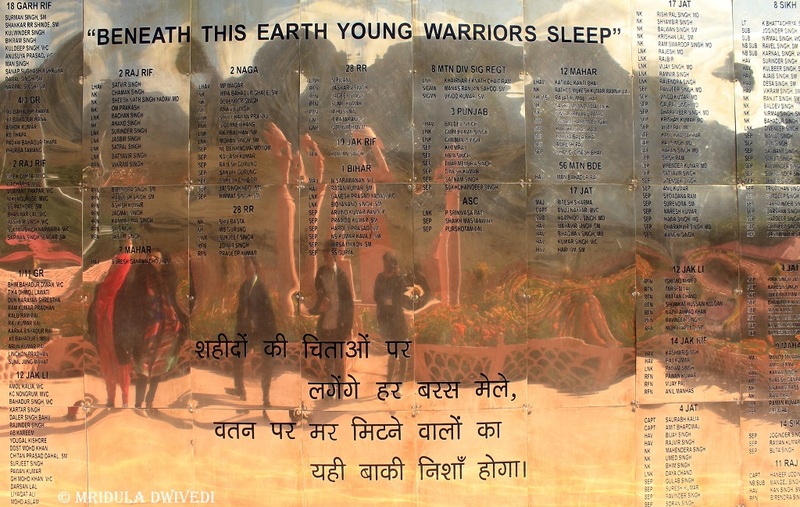 But at the Kargil War Memorial, I was wearing my shades inside the Manoj Pandey Gallery too. The Gallery depicts the story of young people, people mostly in their twenties, who lost their life in the war. 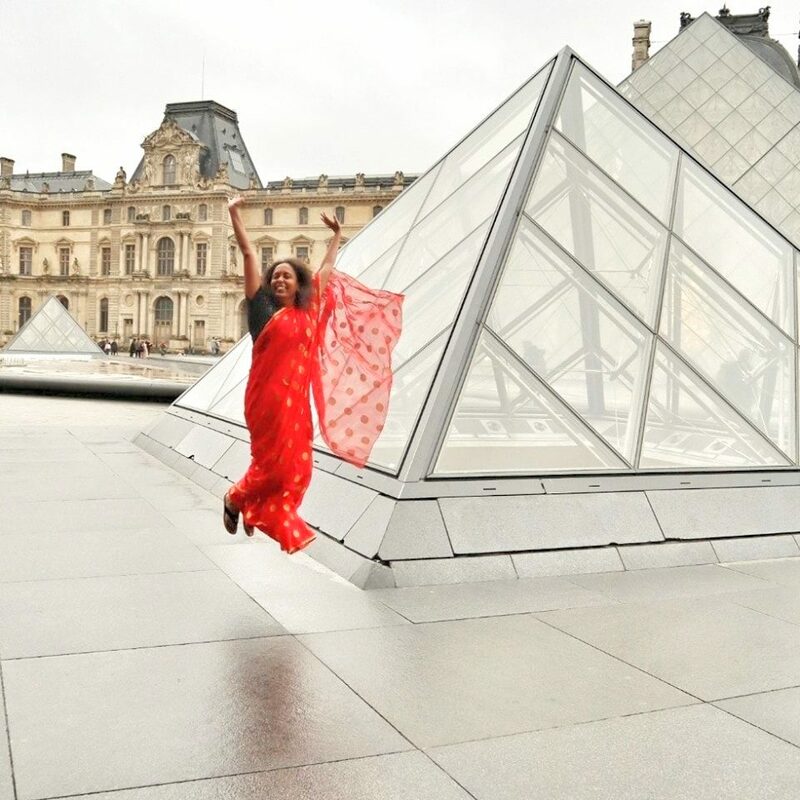 It is that age when the rest of the world posts weird photos on Facebook and tells the world they are trying to find their true calling. At that age people passionately debate the meaning of ‘freedom’ from their comfortable living rooms. 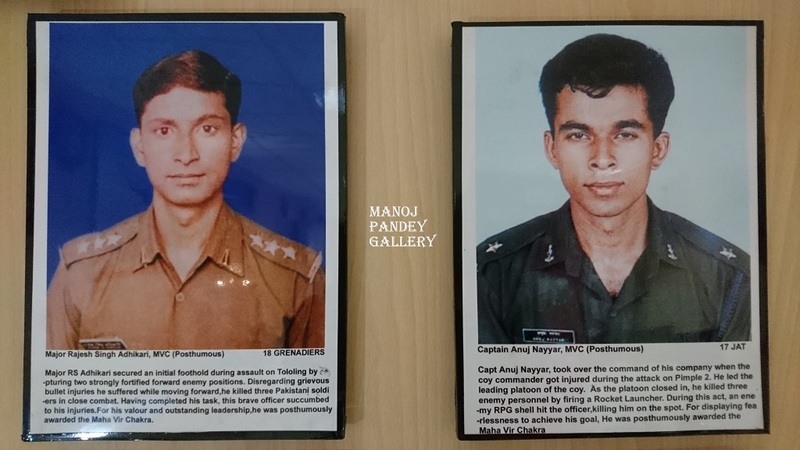 It was that age these young people in uniform were defending the nation with their lives! While walking out I read the words of John Maxwell Edmonds itched on the gate “When you go home, tell them of us and say, for their tomorrow we gave our today.” What it doesn’t say is how young they were when they died! My taxi driver Ahmed mentioned, “madam when you go back, do write about us, about Kargil and tell them it is a safe place. People think of Kargil only in relation to the war. It is not true.” And yet war, in some sense, is Kargil’s identity too. Talk to the locals and they will tell you that army and civilians have cordial relationship in Kargil. Another taxi driver told me, “People of Kargil serve the army, they work with the army”. It is said that the locals informed the army of infiltration in 1999 as they saw strangers buying rations in the local markets. The people of Kargil proudly tell you, “you cross the Zojila Pass and it is different world out here.” I agree with them! I wonder what it is about Kargil that is so different from Kashmir! 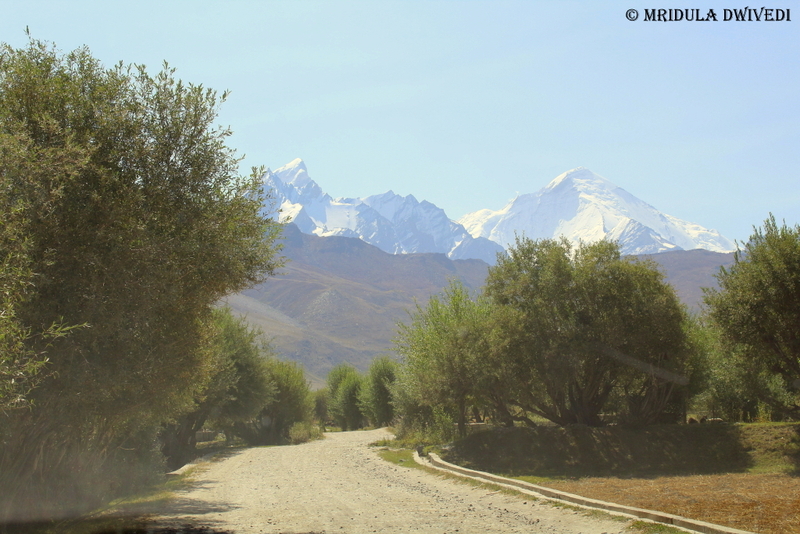 I have a personal bond with Ladakh, this blog came into being because of our trip to Ladakh, way back in 2005. Little did I know that one day I would quit my full time job as a professor and do full time blogging. I traveled for the fourth time to Ladakh for the Axis Dil Se project. Axis Bank along with 17 Thousand ft Foundation funded more than 100 government schools under the Axis Dil Se project. The endeavour was to bring a playground and a reading room for the kids for selected schools. I attended the inauguration function at two schools at Drass and Namsuru in the Kargil District. It was my pleasure to be a part of the excitement generated by the kids for this unique project. Axis Bank had a team on the ground which consisted of business leaders and young management trainees. But let me start at the beginning and for Leh, it has to be the landing at the Kushok Bakula Rimpochee Airport. If you are flying into Leh, chances are you already know that the best views are on the A side windows and while coming back, it is the F side window you clamor for! 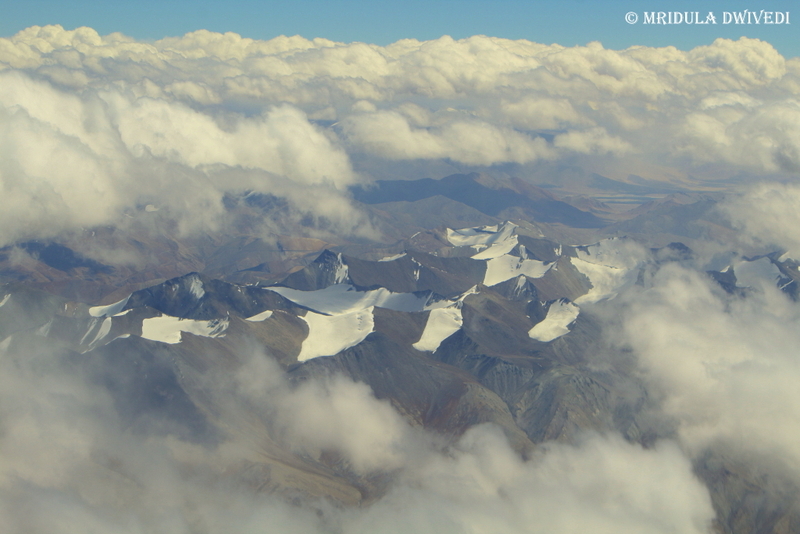 Flying over the Karakoram Range is an experience you never get tired of. This was my third landing at Leh, the first visit being a road trip, and I was still glued to the window! In Ladakh the journey is the destination. I visited various tourist attractions, like the confluence, Spituk Monastery, Hundarman etc. but it is the scenery along the road that holds me in thrall! If I could have it my way, I would stop the vehicle every few meters to click a picture. But as I could not have it my way, I could click nonstop from the moving vehicle. 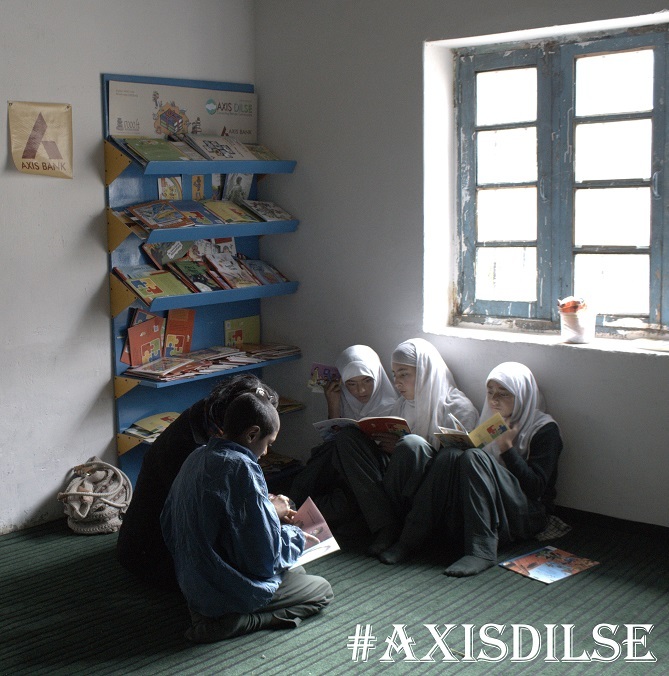 The Axis Dil Se is a fabulous project as it aimed to provide much needed recreation and learning to young minds. I gathered from various discussions that people who can afford, send their kids to private schools in faraway places. So, any attempt to raise the standard of the village schools is to be appreciated as the kids don’t need to get separated from their family at a young age. 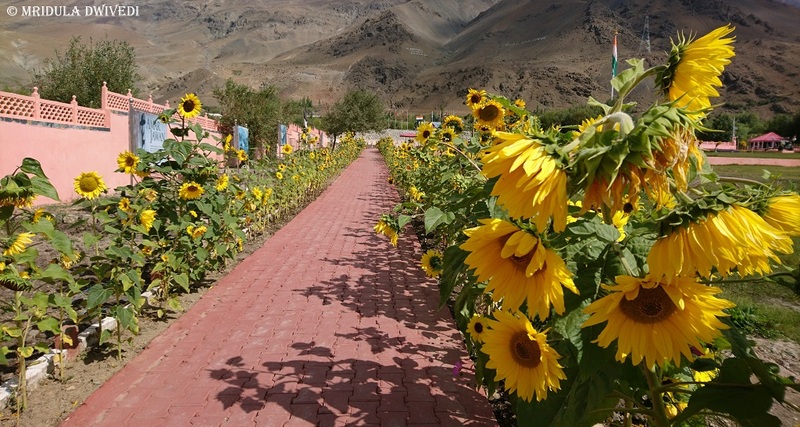 Axis Dil Se along with 17 Thousand ft Foundation has tried to raise the standards throughout the Ladakh region. Axis Bank’s business leaders along with young management trainees participated in the program. 17 Thousand ft Foundation also had a big team of local experts on the ground to support the project. 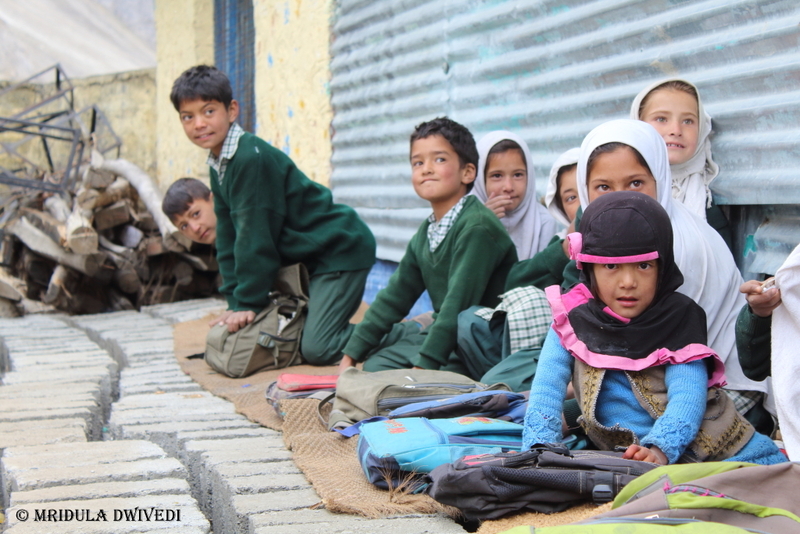 The Awesome Kids of Kargil! For me the biggest joy was interacting with the kids in their schools. The first school that I visited was the Government Middle School in Drass. The kids presented a fabulous cultural show. I could see the involvement of their teachers too! But what impressed me most was their laughter, they would roar in unison at the smallest thing, like a scuffle during the musical chair! 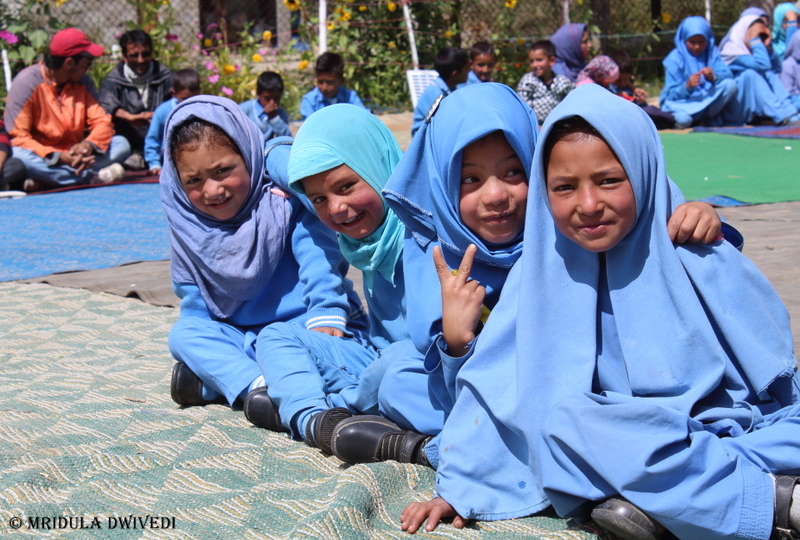 At the end of the program at Drass, the kids went to the playground! And their joy was obvious! Do watch the video to catch a glimpse of it. Namsuru is a beautiful village where I attended the second inauguration. Here too the kids put on a wonderful show. What impressed me most that the girls had already taken out the books from the library and reading it while watching the cultural show. Now that I am firmly back to my city life, I am reminded of how much I take for granted in this life. I, for sure, all my life took playgrounds and libraries for granted. I never thought of them as anything extra special. My daughter does the same. And then I remember the look on the face of kids while they came down a slide, or went up the swing, and I think how blessed are they who laugh readily, who do not really understand pollution or daily traffic jams. The kids from Kargil reminded me to feel grateful at what I have, rather than constantly crib!